Tag line: "Beg For Your Life, Pray For Your Soul, But Whatever You Do... Don't Make A Wish!" A dockside accident, in which a crate containing a centuries-old statue comes crashing to the ground, kicks off a chain reaction when a dock worker finds a large jewel sitting among the shattered pieces. This jewel eventually ends up on the desk of Alexandra (aka “Alex”) Amberson (Tammy Lauren), who works as an appraiser for an art auctioneer. As Alex will soon discover, this is no ordinary stone; during her inspection of the jewel, she inadvertently releases a Djinn (Andrew Divoff), a demonic creature that, after enslaving the souls of several innocent people, grants her three wishes. But Alex knows better than to trust this Djinn; with the help of folklore professor Wendy Derleth (Jenny O’Hara), Alex learns that the moment the Djinn grants her third wish, an ancient evil will be released into the world, a force so powerful it’ll enslave the entire planet. Can Alex survive this battle of wills, or will the wily Djinn trick her into making that third wish? 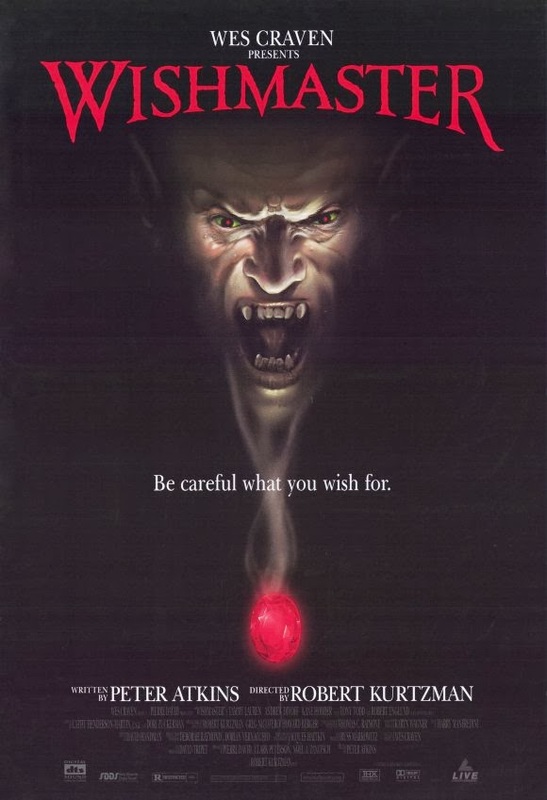 This premise alone was enough to make director Robert Kurtzman’s Wishmaster one of the most unique horror movies of the ‘90s, but what really set the film apart was its special effects, as well as the performance of Andrew Divoff in the title role. Utilizing the skills of, among others, effects guru Greg Nicotero (who had previously worked on such movies as Day of the Dead, Predator, and In the Mouth of Madness), Wishmaster features some good effects; an opening sequence set in 12th century Persia, where we’re first exposed to the incredible power of the Djinn, has everything from a man encased in a stone wall to a snake-like creature slithering around on the ground. Even the look of the Djinn is striking, and the various bits of gore scattered throughout the movie enhance the horror of this most unusual story. Then there’s the Djinn itself, brought to life by Divoff’s deliciously evil performance. His booming voice, coupled with an overpowering screen presence, helped transform Wishmaster into one of the ‘90s better horror films. Wishmaster also boasts a number of celebrity cameos, including Robert Englund (A Nightmare on Elm Street), Tony Todd (Candyman), and Ted Raimi (The Midnight Meat Train), as well as a handful of jump scares (one of which features a jar of eyeballs). In the end, though, neither the cameos nor the jump scares mattered all that much. 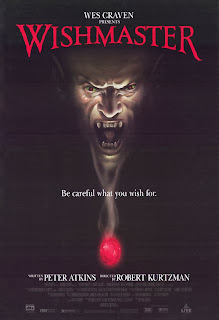 Thanks to Greg Nicotero and Andrew Divoff, Wishmaster was a movie you were going to remember anyway. Fantastic, Dave! I love WISHMASTER. it's such an under-appreciated film, especially due to its thematic value. It's a shame so many just write it off. Excellent review!